This is an excellent foundational set of chisels for those new to carving! 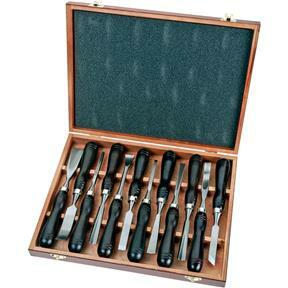 Chrome-vanadium steel blades with stepped tangs and hardwood handles with steel ferrules are built for rugged use. 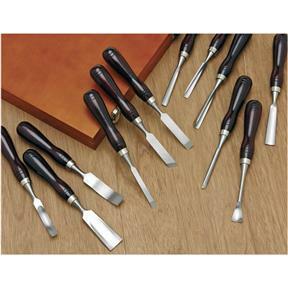 Handles measure 4-3/4" long and chisels measure 8-3/4" long overall. 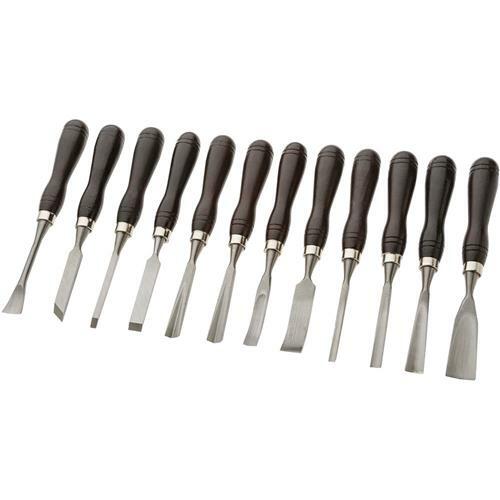 Set includes: #7 sweep 1/4" gouge, #7 sweep 3/8" gouge, #7 sweep 5/8" gouge, #5 sweep 1" gouge, #7 sweep bent 3/4" fishtail gouge, #7 sweep 1/2" bent gouge, 5/16" straight, 9/16" straight, 3/4" bent straight, 9/16" skew, #13 sweep V-parting, #14 sweep V-parting, and fitted wooden box. This item was purchased as a gift, I know the receiver was very happy when he unwrapped the gift.